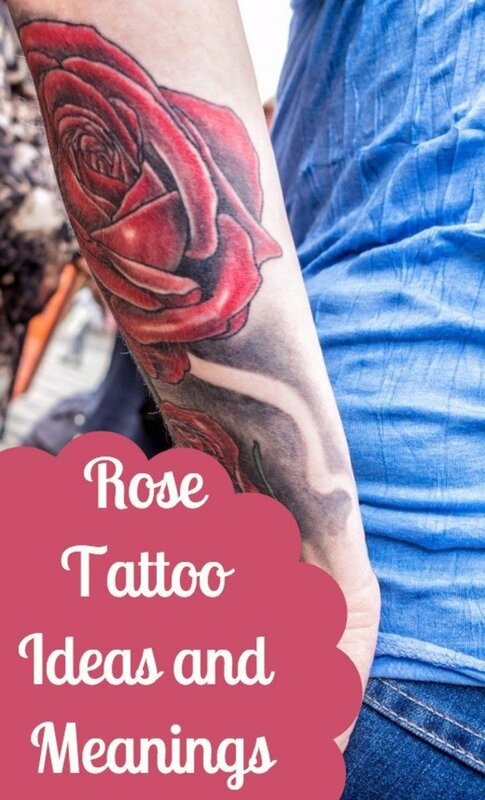 Flower tattoos have become very popular over the last several years as a growing number of women choose to have some type of ink done on their bodies. Among them, the daisy is the flower of choice among many women making that decision. Daisies have always been a very positive flower, as it's not only fun to grow work with, but they add a delightful color to the garden and are used to put in the hair or pick the flowers off when deciding if someone likes you or not. One flower petal off says yes and the next says no. Do you remember playing that little game when you were younger? Among many people the daisy is also representative of quality traits and experiences such as love, purity, faith and loyalty. 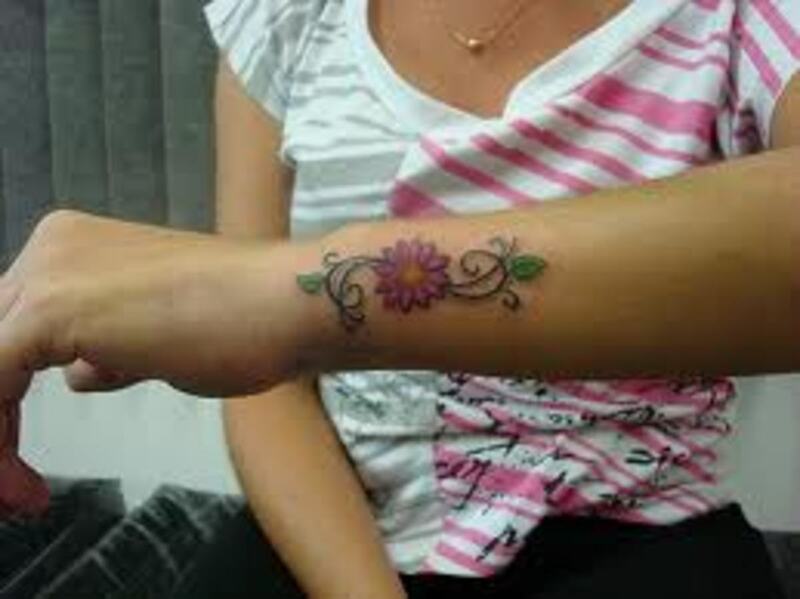 As for design, those simple petals, round middle and variety of colors and looks are great material to choose from by artists and those desiring a daisy tattoo. They look fantastic whether they're done in color or darker, and work good in settings with additional themes to create a scene; although they are equally as good if they stand alone. What I really like about the daisy tattoos I've seen are the way the artists chose to be more subtle, rather than loud, when using color. The daisy seems to be more compelling to me when it's done in that way, as it's a humble little flower that shouldn't be displayed too loudly, as far as color goes. 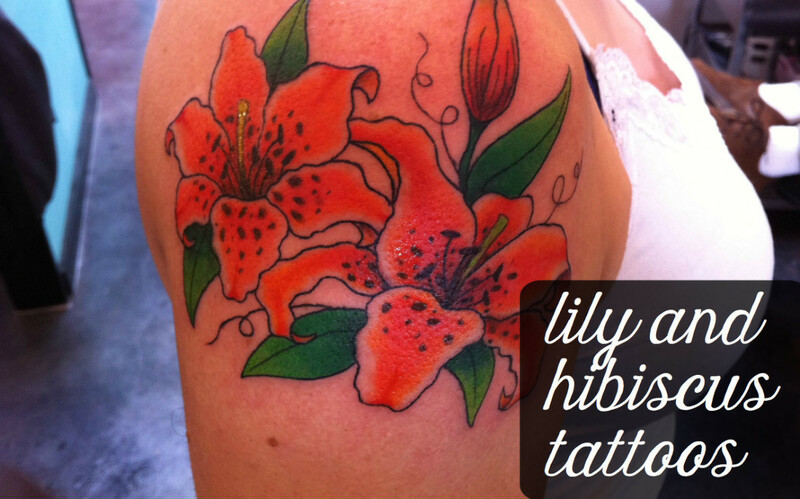 Let's take a look now at a number of daisy tattoos in this gallery. 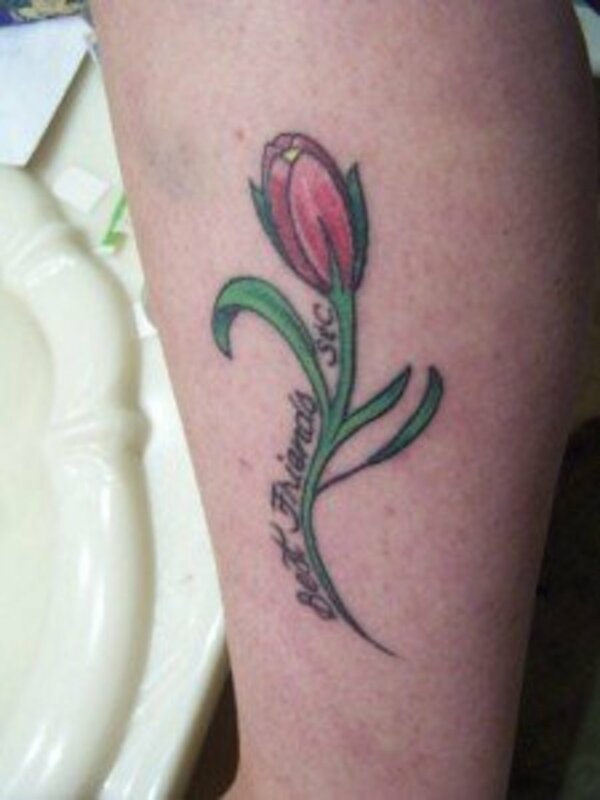 With this first daisy tattoo we see a good example of one with subtle, rather than loud, color. 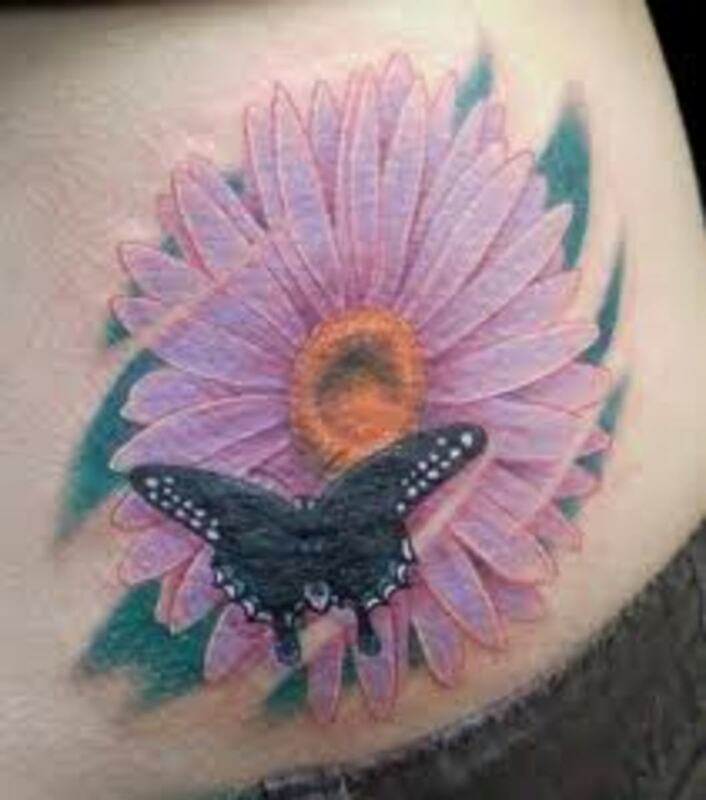 My favorite part of this tattoo is the shading, which works darker from the outside of the flower petals to the inner part, which is very bright colored. That works nice. The little orange part of the daisy in the middle is done very well also. 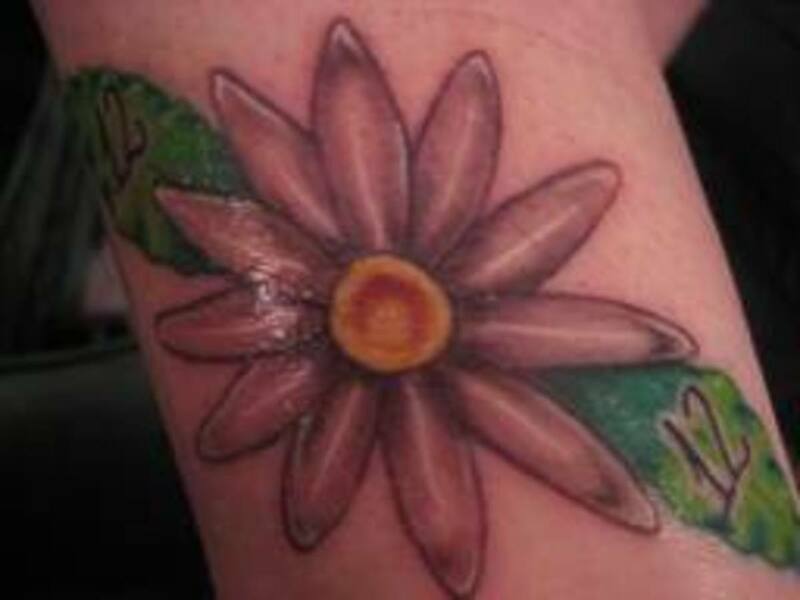 The weakness of the tattoo design to me is the inclusion of the green behind the daisy. It somewhat clashes with the flower, taking a little away from it. I think the #12 would have looked better on the bare skin, rather than overlapping the green. 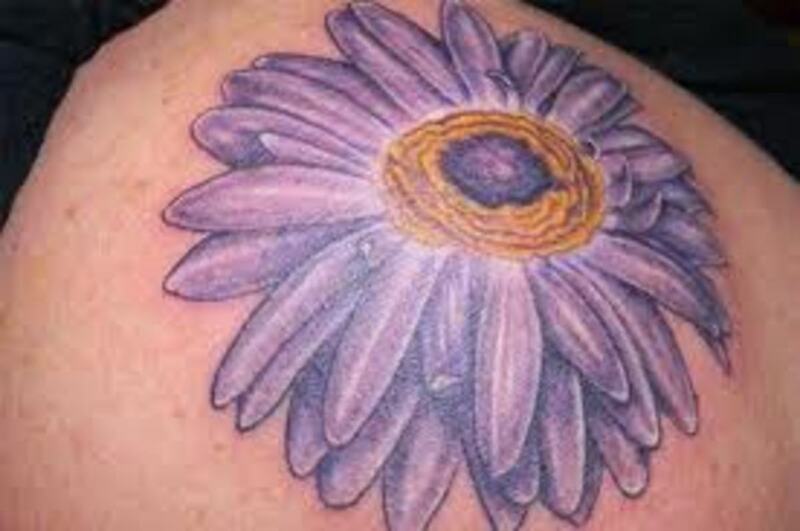 This purple or lavender tattoo placed on the shoulder looks nice, but seems to be a little too big for me. Daisies look much better when when they're a little smaller than this one, although it still looks pretty. good. I like the color, and the detail of the round part of the flower with the purple inside the orange circle is nice. The inclusion of the ant was a nice touch, as he appears to be ready to ambush an unsuspecting little critter. What helps set it off is that purple background which gives you the sense of the daisy being presented to you. Personally, I've always like darker ink than any other, and this daisy tattoo design is a good illustration of why that is so. 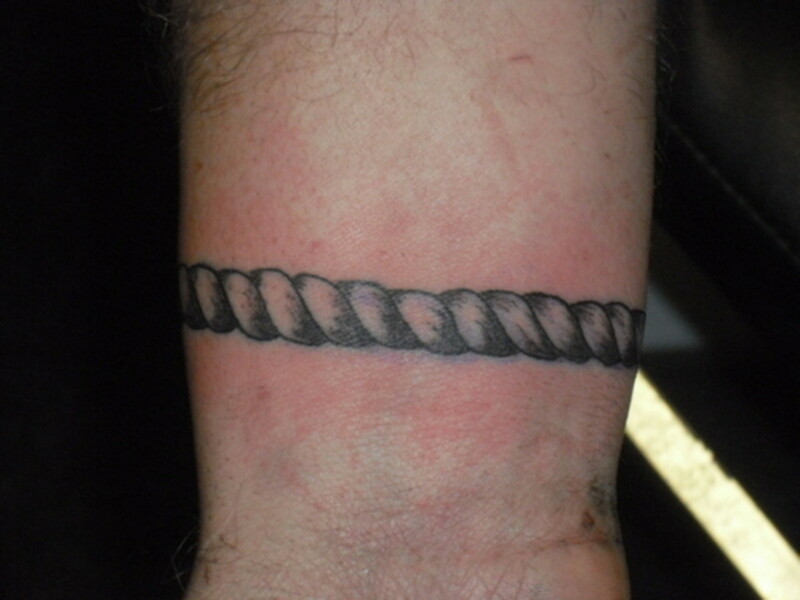 What stands out with this tattoo is the depth created by the artist. You almost get the feel there is a little cavern behind the daisy, or that it's deeply carved into the skin. The petals look awesome and the big, round center really works too. I like how this daisy looks different in that the decision was made to have a little bit of light color on the edges of the daisy working in. That also helps capture the form of the flower with the darker background. It works great. Fairies are a very popular theme for tattoos as well, and when this one is combined with the daisy flower they really look great together. What is most compelling about this design is the way the petals of the daisy and the wings of the fairy were made the same color; almost as if there is a connection between the two we can't fathom. 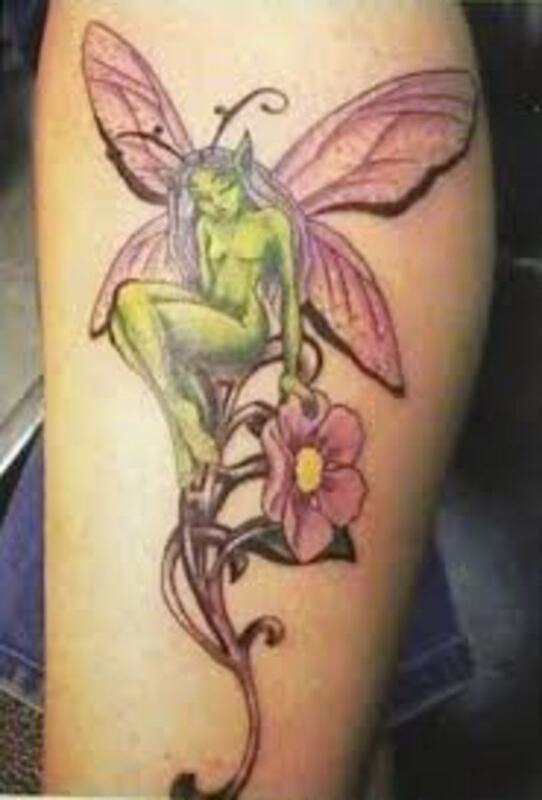 Having the fairy sitting on the stem of the daisy was a great choice. 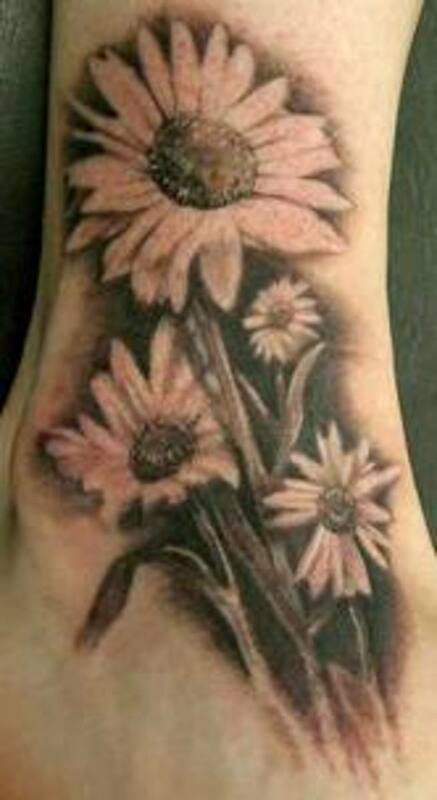 Using scrolling with tattoos is one of my favorite part of tattoo art, and with this daisy it really works. The lines of the scrolling are very clean, and those curves on either side of the daisy are fantastic. 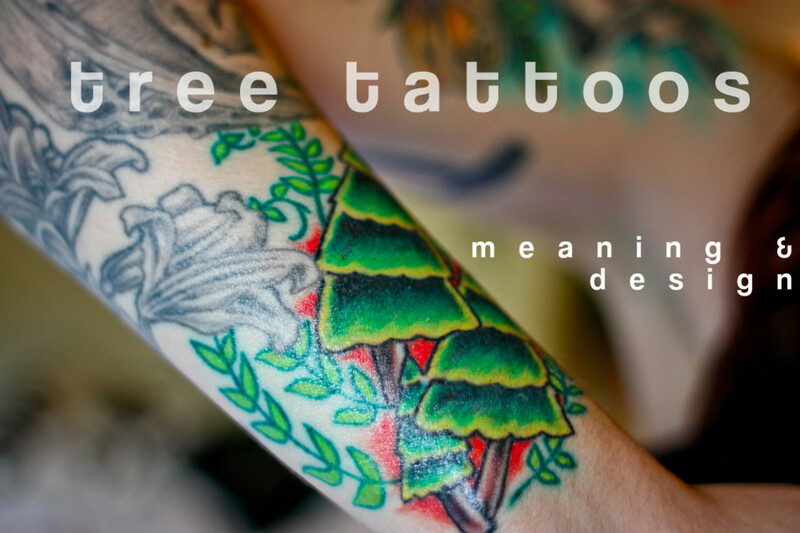 Those little green leaves near the curves of the scrolling accentuates the rest, completing a great tattoo. 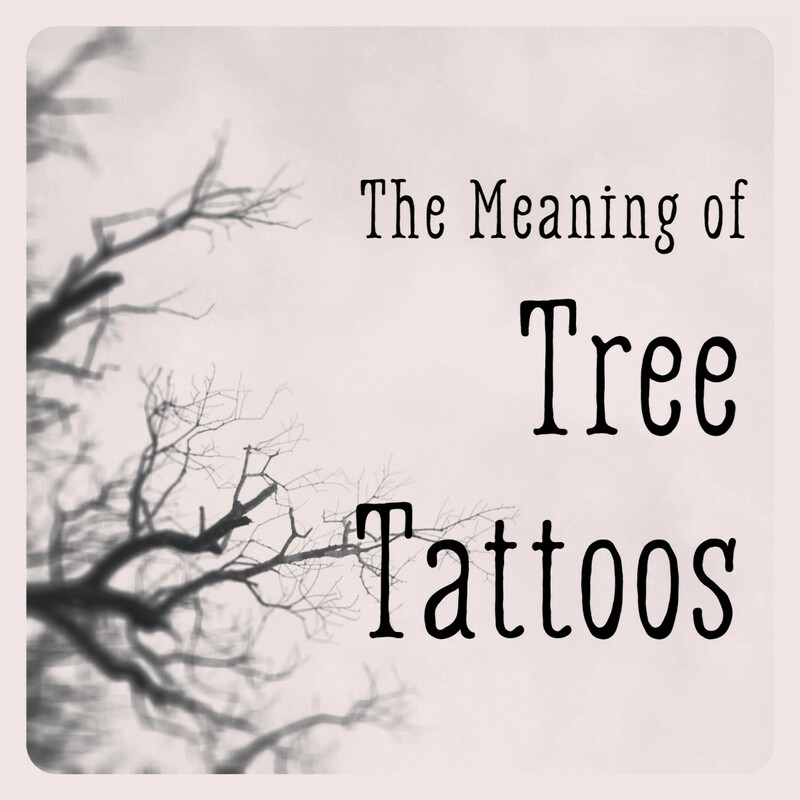 To me, this is why using a simple, humble daisy as the inspiration behind a tattoo works so well, as you can use it as the centerpiece of the tattoo, or as a part of the overall look. The simplicity of the daisy also lends itself to being used in small places, as displayed in this photo of one placed on the two of the recipient. You can tell the artist struggled with this one, as there are compensations to make when working on such a small canvass. Still, while not a masterpiece, it is cute, and that sometimes is more compelling when using it to strike up a conversation than those that appear to be almost masterpieces. This dainty daisy looks good in that regard. Using complementary images like this butterfly with flower tattoos always adds a nice dimension to design when it's done right, which this one is. The color combination looks good here, and the background helps present the daisy nicely. The fluttering butterfly finishes off the beautiful little scene, with the choice of black with white spots on the wings looking good. 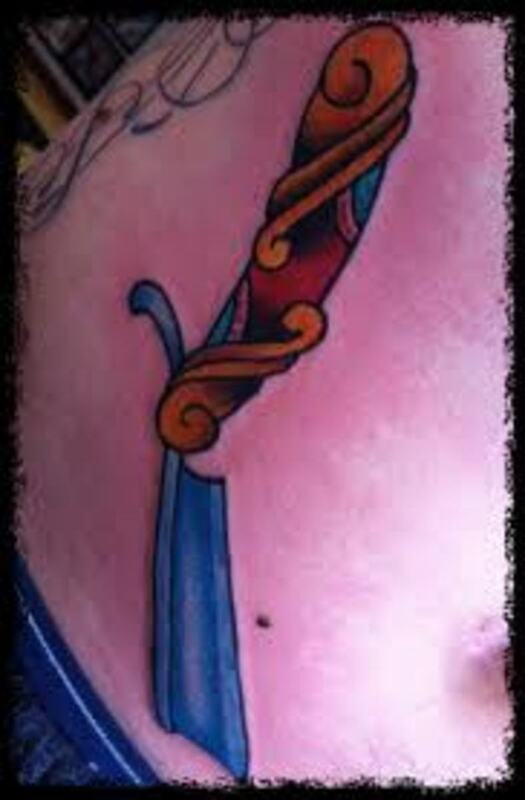 The off-center eyes on the butterfly is my only quibble, but otherwise a good tattoo. 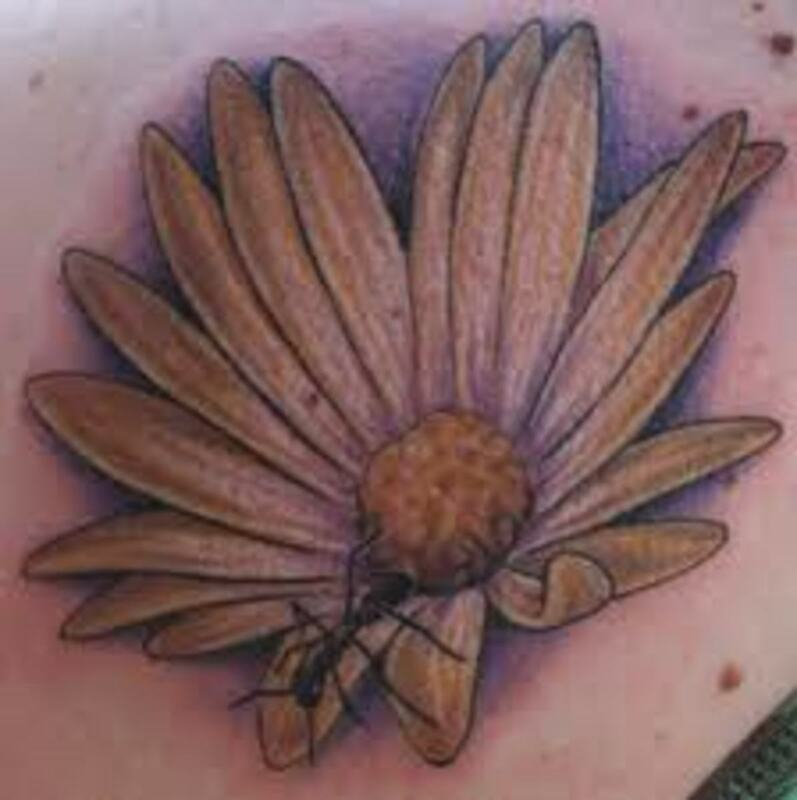 This group of daisies is a really compelling design, and I love how the tattoo artist makes you believe they are gradually a little farther off than the one before it. That is done making each successive flower a little smaller, and by decreasing the detail as they fall into the background. The white daisy petals backstopped by a black back ground really allows you to see the daisies easily, making them stand out for viewers to enjoy. I really like this one. 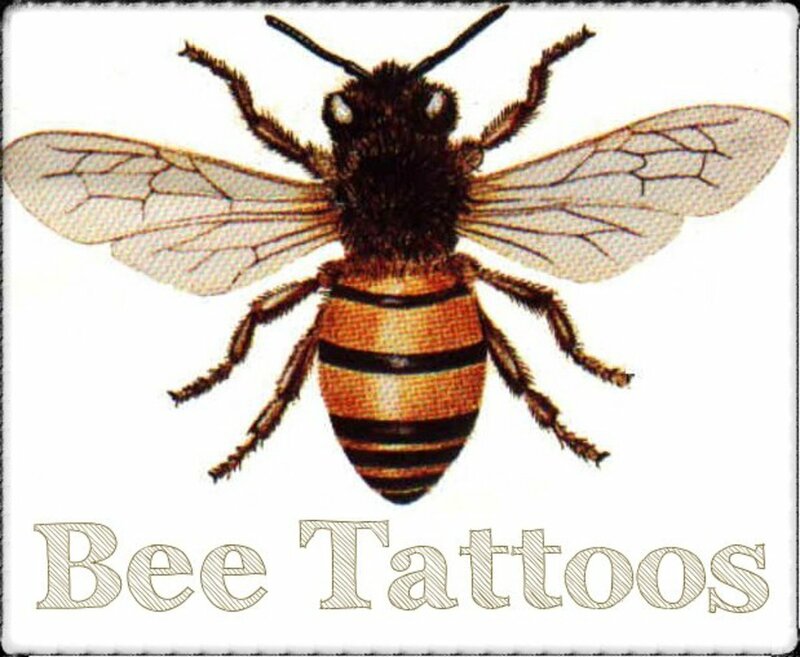 Being a lover of daisies and fan of tattoo art and design, this was a very enjoyable gallery of daisy tattoos to look at for me. There wasn't one I didn't like, and minus a few small changes, were very well done. 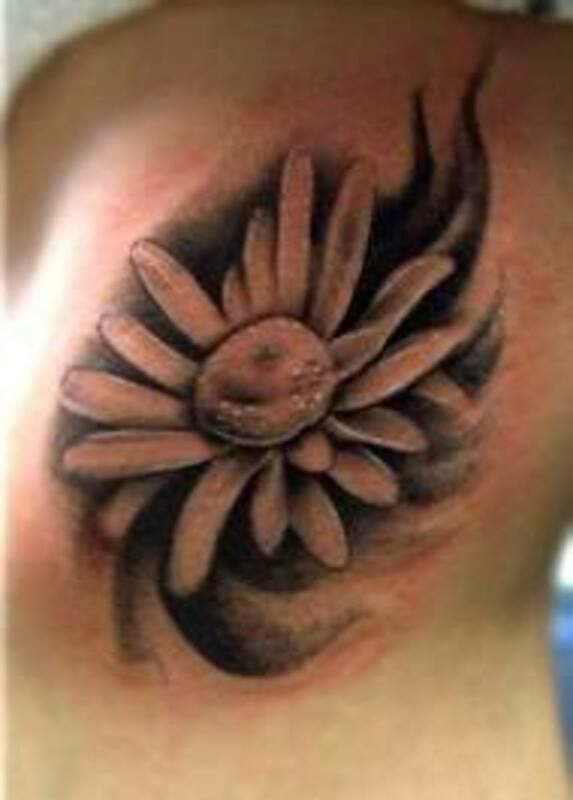 Using a daisy for the inspiration behind your tattoo decision is one that should work very well for anyone making it.